This icy cool dessert is a great freezer stand-by, and makes a refreshing summer pudding, or perhaps serve as an alternative to after-dinner coffee. Pour the hot coffee into a jug and stir in the sugar until it has dissolved. Allow to cool. Stir in the cream liqueur and pour into a 1-litre lidded plastic freezerproof container. Cover then place in the freezer for 4-5 hours. Every 30 minutes or so, use a fork to break up the granita gently to bring in the edges as they start to freeze. The granita is ready when you have a mixture that is frozen but quite granular and in icy flakes. 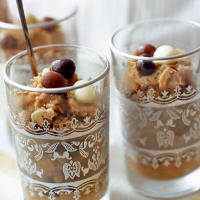 Serve the granita in small glasses and top with a couple of the chocolate coffee beans or a dollop of softly whipped double cream. Granitas are easy to make since they require no special equipment. For a non-alcoholic version, replace the Columba Cream Liqueur with 150ml of Waitrose Colombian Coffee Flavoured Milk.